With this tool, you can turn your computer into a karaoke recording studio. 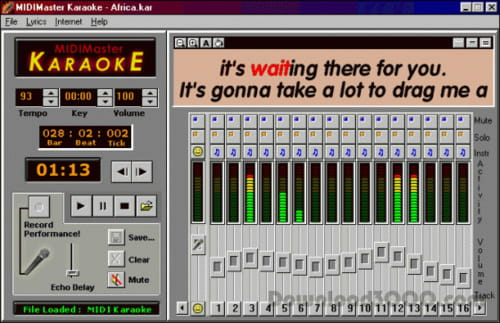 Simple and effective, MIDI Master Karaoke is a tool with which you can turn your computer into a karaoke studio one. The application can play both MIDI files and Karaoke files. Let us remind you that these file formats are the most used on the Internet. In fact, users can play, mix and orchestrate these two file formats. MIDIMaster Karaoke users can adjust the echo of the file track to you vocal performance and well as adjust the tempo and the key of the karaoke file. It is also possible to change the instrumentation for each track which depends on the needs and the timbre of the user's voice. As for the user interface, changing the font, background color and lyrics window size is to be within reach of all users. The application also offers a visual display that is showing both the time lapsed and the bar, tick and beat information for each played track. With MIDI Master Karaoke, you can customize the music for your singing style. The application expires after 30 days of use, then, you need to pay for a license.